Opal Agafia & The Sweet Nothings is an Ozark Mountain Soul Roots n Roll group from the hills of Arkansas. Lead vocalist and songwriter, Opal Agafia, entered the music scene in January of 2015. Shortly after playing in local joints with various musicians, Opal Agafia & The Sweet Nothings, developed into a full string band–fiddle, mandolin, guitar, dobro, telecaster guitar, electric bass, and drums. Together this band puts on a high energy show while focusing on the words and instrumental combos. Over the year, Opal Agafia & The Sweet Nothings have stayed involved in the NWA music scene. They’ve played a variety of music venues and festivals. Spring 2016 saw the release their first album, “One Down, Forever To Go.” While still a college student, Opal Agafia began a songwriting collaboration with her mother, DeAnna Smith. Their songs reflect their deep roots on the Ozark Highlands, as well as their concerns for the current conditions and future of the region. They know their history, but they do not long for it so much as they explore how it influences the present and will influence the future. Their approach is both fresh and familiar. Drawing from many genres, Opal Agafia & The Sweet Nothings blend the best elements of soul, blues, jazz, gospel, country, swing, and traditional mountain music into a sound that captures the past and boldly looks forward to what is coming next. Their fan base is an interesting and eclectic blend of folks who seem to find something that speaks to all of them in their particular diversities. 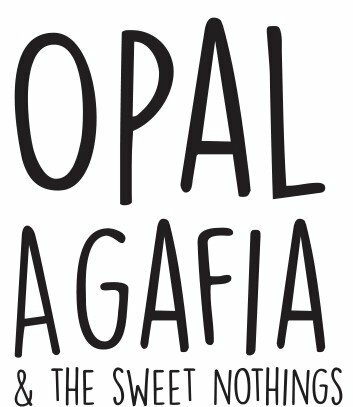 Opal Agafia & The Sweet Nothings sound is fearlessly haunted by those who came before them, and they seek to add their spirit to new generations of listeners who come after them.